In 2013 The University of Oxford was awarded £2.5 million over 4 years to establish a British Heart Foundation Centre of Regenerative Medicine (BHF CRM). The Centre, in partnership with the Universities of Cambridge, Bristol and Manchester, was renewed in 2017 and awarded a further £2.5 million over 4 years. This is one of three national research hubs specialising in cardiovascular regeneration funded by the BHF, the other two are based at the University of Edinburgh and Imperial College, London. The three UK centres work together and have a single International Scientific Advisory Board (SAB). 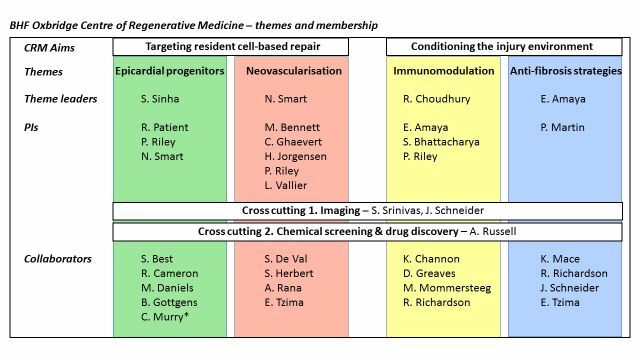 The Regenerative Medicine Centre contains 13 Principal Investigators and 15 Core Collaborators (from Oxford, Cambridge, Bristol and Manchester) under the Directorship of Professor Paul Riley (BHF Professor of Regenerative Medicine). There are two major aims across the Centre: 1) Targeting resident cell-based repair; 2) Conditioning the injury environment. These aims encompass joint projects and pump-priming to facilitate applications for further funding.